- Construction completed in: 2000. - Height: 1053 feet (321 m) to top of spire. - Height of Atrium: 112 m.
- World's tallest hotel in 2000. - World's tallest atrium in 2000. - Number of Stories: 60. - Interesting facts: Built on an offshore man-made island. 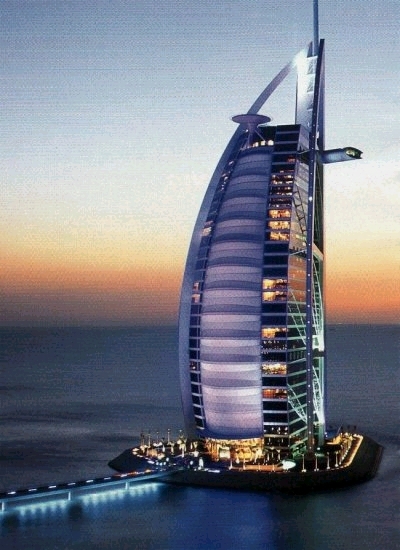 Where can I learn about the Burj Al Arab? View the Burj Al Arab on a Google map. Fame: World's tallest hotel, world's tallest fabric-covered structure. 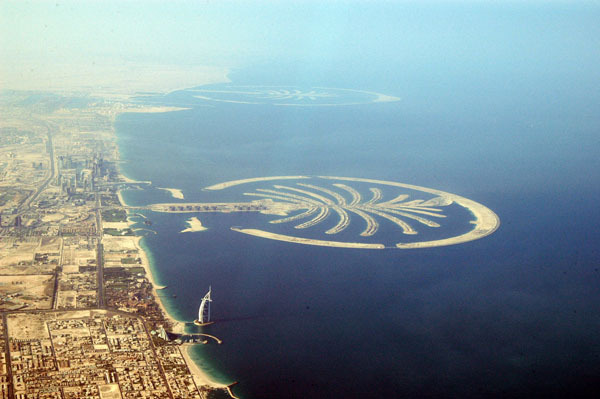 The Palm Jumeirah is the smallest of the three Palm Islands (Palm Jumeirah, Palm Jebel Ali and Palm Deira). It is located on the Jumeirah coastal area of the emirate of the Dubai, in the United Arab Emirates (UAE). 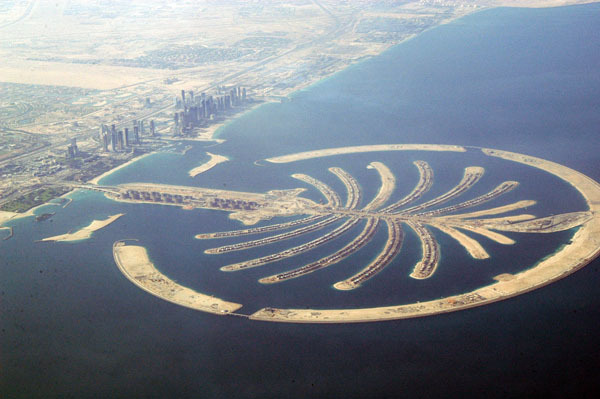 The unique human-made island is built in the shape of a date palm tree and consists of a trunk, a crown with 17 fronds, and a surrounding crescent island that will form a water-breaker. Where can I learn about the Palm Islands? Fame: World's largest human-made islands. The World Islands are a collection of human-made islands shaped into the continents of the world. The World will consist of over 250 to 300 small private artifical islands divided into four categories - private homes, estate homes, dream resorts, and community islands. Each island will range from 250,000 to 900,000 square feet in size, with 50 to 100 metres of water between each island. It will cover a total area of 9 kilometers (5.4 miles) in length and 6 kilometers (3.6 miles) in width, surrounded by an oval shaped breakwater. The only means of transportation between the islands will be by marine transport. The World Islands will be located 4 kilometers off the shore of Jumeirah, close to the Palm Jumeirah, between Burj Al Arab and Port Rashid. Where can I learn about the World Islands? View The World Islands on a Google map. Fame: World's largest collection of human-made islands. 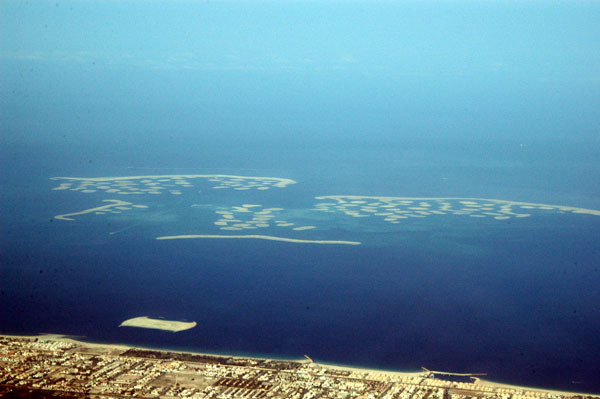 View The Palm Islands on a Google map. - Function: The majority of the tower's floor space is dedicated to offices. Some floors have been designated as retail, while others contain residential space. - Height: 828m (2,717 ft.). - Completion date: October, 2009. View The Burj Khalifa on a Google map. The amount of new construction in the Dubai area is absolutely overwhelming. Currently, over 80 projects are underway, ranging from the expansion of the Dubai airport, to what will eventually be the world's tallest building, the 800m Burj Dubai, to construction of numerous residential buildings on the World and Palms islands. The estimated value of the projects under construction exceeds US$200 billion. Where can I learn about the Burj Khalifa? Watch video of the grand opening!